The dollar used to be worth more than six British pounds; now, it's worth about half of a pound. A greenback used to be worth three Swiss francs; today, the two are almost equal. The U.S. currency has already lost nearly 30% against the euro, which is barely six years old. And the dollar is at a nine-year low against the Thai baht, a country that recently experienced a military coup! Now, I don't know exactly when the crisis will hit, or what the cause will be. It could start with derivatives, a hedge fund collapse, the bond market, or in some other over-leveraged, overly speculative area. Regardless, I see a crisis on the immediate horizon, and it won't be pretty. If you want to uphold your financial security, you should take action now. Don't delay! My trading models have guided me through every crisis since I developed them in 1982: The 1987 stock market collapse, the ensuing bull market, the first Gulf War, the peak in 1999, and the crash of 2000 - 2003. My systems flagged every one of these events well in advance. Right now, the models are telling me that the stock market has a bit more upside in it, and that when the crisis hits, stocks will be viewed as — believe it or not — a safe place to be invested. The Dow Jones might even go as high as 13,000. But listen carefully: If stocks rally any further, as my model indicates, it will be the biggest trap since the Dow peaked in 1999. Keep in mind, markets love to trap the majority of investors, and it always happens when least expected. New highs in the Dow will get most investors thinking stocks are headed to the moon, but the result will be a fitting end to the three-year bull market. Look, even if the Dow does manage a last rally, there is no way it's worth current valuations. It's trading at 17 times trailing earnings when earnings growth for the current cycle has likely peaked. Its dividend yield is a lousy 2.24%. Plus, a falling U.S. dollar is devaluing asset prices for foreign investors heavily invested in dollar-denominated assets like U.S. stocks. Stocks in the U.S will not ignore these fundamental forces forever. So while the broad markets may rally one more time, even reaching as high as 13,000 on the Dow, I urge you not to get trapped. U.S. government bonds are poised for a major slide. There's no other choice here. Why? Because a slowing U.S. economy will make the dollar even weaker than it already is. Washington is the most indebted government on the face of the planet, with over $44 trillion in outstanding IOUs. That alone has been sending the value of the U.S. dollar into the gutter. Slowing economic growth will only make it worse. The reasoning behind this is simple: Anyone who wants to lend money to the U.S. will demand higher rates of return to compensate for the risks. That's only natural. After all, would you buy bonds (lend money) to a company that's hugely indebted and whose sales are slumping? If you did, you'd want 10%, 11%, even 15% on your money. It won't be long before investors in U.S. government bonds want the same. And the only way they'll get what they want is from a collapsing bond market, with prices falling and interest rates soaring. Property prices in the U.S. are still overvalued in most regions of the country. 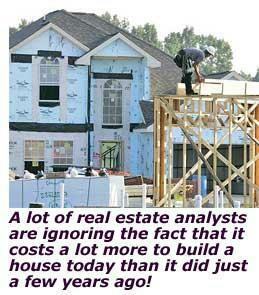 So another nosedive in real estate is likely, especially with stocks and bonds also collapsing. But mark my words: Sometime next year, after the dust settles, real estate will be one heck of a buy. Land is in limited supply. And good locations are in even more limited supply. Waterfront property is the best example. Construction and replacement costs are rising rapidly. Six years ago, I built a new home in Palm Beach County at a cost of roughly $65 per square foot of air-conditioned living space. Today, the exact same construction would cost nearly twice that because of rising prices for everything from lumber to paint. Overseas investors with money are ready, willing, and able to buy property in the U.S. As the dollar continues to fall, these investors will switch from stocks to gold and real estate. In short, by this time next year, I expect foreign investment to start pushing up U.S. real estate prices, especially in areas like Florida, Arizona, Las Vegas, New York, and California. A big part of the capital flooding into U.S. real estate will come from Asia. Remember how the Japanese rushed into the U.S. real estate rush in the late 1980s? Well, this time, get ready for a huge influx of money from China and India. You Will Want To Be Invested in Gold! Gold is already starting to soar. When the crisis hits, and the three prongs collapse, gold will soar like a rocket. I expect it to go well above $1,000 an ounce, and then, even higher. Remember, unlike stocks or bonds, gold has no debts, no earnings, no board of directors, no funny accounting statements, and no obligations to anyone but itself. Gold is the purest investment in the world. While paper money can be printed or devalued at will, the same cannot be said for gold. Gold is the only real money . First , minimize your exposure to the stock market. With the exceptions of the gold and natural resource stocks recommended in my Real Wealth Report , get out of all other stocks now. Don't even try to make it to next year to defer taxes on profits you might have. It's not worth the risk. I figure it's better to pay Uncle Sam his take than risk losing hard-earned gains. Even if the Dow rallies further first, I believe it could easily give up 1,000 points by the start of 2007. Second, continue to keep the bulk of your money in safe, liquid, short-term investments such as money markets. You can get 5% a year ... even a tad higher in some cases. But by all means, stay out of long-term bonds, whether issued by the U.S. government or private corporations. Third, if you don't own any gold, I think you're making a huge mistake. The best way to buy gold, in my opinion, is the streetTRACKS Gold Shares ETF (GLD). Each share represents 1/10 of an ounce of gold. When you buy this fund, it's kind of like buying a mutual fund, but one that holds only physical gold. Plus, you eliminate storage and shipping worries because the gold is held in trust for you. Or, if you'd rather buy a gold stock mutual fund, my two favorites are DWS Gold and Precious Metal (SCGDX) and Tocqueville Gold (TGLDX). As an alternative, look at the Market Vectors Gold Miners ETF (AMEX: GDX). This single investment holds ten of the largest gold miners in the world. P.S. For my specific recommendations, take out a subscription to Real Wealth Report for a modest $99 a year. You'll get 12 monthly hard-hitting issues, plus daily commentary on my website, flash alerts, advance notice of special situations, and more. Yes one day you will be right !, but until then ?? It is time for suicide. >Land is in limited supply. The fact is that there's enough land in Montana alone to give every American family a full acre. While land supply is not unlimited, it certainly is not in short supply. >And good locations are in even more limited supply. Waterfront property is the best example. You should have stuck to this sentence, as it's true. While you can give everyone an acre in Montana, not everyone wants the acre in Montana. The problem is not supply, but supply in a desired location. 12 Jun 07, 02:31 Personal Immortality, or “Clash of Civilisations”? Personal Immortality, or “Clash of Civilisations”? October 2—The lying news media will never tell you, but the world is now plunging into the greatest economic and financial collapse in centuries. This is not something that is going to happen, it is something that is happening right now. On September 27, for instance, the 16 largest banks in the United States met at the New York Federal Reserve to figure out how to stop the world financial system from immediately blowing to smithereens after the US$9 billion Amaranth hedge fund of Greenwich, Connecticut declared bankruptcy the previous week, upon the heels of dozens of others of the 8000 hedge funds worldwide. The bankers privately admit that the situation is “a thousand times” more serious than when the $2 billion LTCM hedge fund collapsed in 1998, which almost blew out the system then. For every $1 of its own capital, Amaranth borrowed $4.50 from banks with which to speculate. So, not $9 billion, but $41 billion went down the chute, which means that entire banks could collapse, as well. In fact, many of the super-speculative hedge funds are merely fronts for banks in the first place. Then, look at the real estate market: September saw 30% collapses in sales and new housing starts in some parts of the U.S., the sharpest plunge since the Great Depression. The multi-trillion dollar real estate industry, in the U.S., in the U.K., and in Australia, in particular, is the centre of the biggest speculative bubble in history, which is now crashing fast. Then look at the guts of the remaining physical economy of the U.S., the auto sector. Ford Motor Co. just offered a buy-out package to all 75,000 of its blue collar workers (how do you produce cars with no workers? ), and fired an additional 10,000 white collar employees. And this comes on top of the de facto bankruptcy and dismantling of General Motors over the last few months, formerly the largest industrial firm in the U.S. This is a global process, and Australia is part of it, as seen in the evaporation of our manufacturing industry, and the growing joblessness and grinding poverty in our big cities, as well as in our devastated rural sector. The financial oligarchy behind this “globalisation”- driven collapse are terrified that they will not consolidate fasci s t cont rol over the wor ld, as they financed Hitler to do in Germany in the 1930s depression, before the bubble pops, and that they might therefore lose their power in the resulting political upheavals. They have unleashed “terrorism”, “Islamic” or otherwise, as a pretext to launch wars all over the globe and to consolidate fascist control at home, as they are now doing in the U.S. and Australia. They aim to unleash a bloody, worldwide “Clash of Civilisations”—for which Howard and Costello have been doing their bit. This is the context i n which U.S. statesman and physical economists, are conducting an extraordinary international series of webcasts with political leader s and government officials from all over the world, in which he is outlining the nature of the political and economic revolutions which must take place to overthrow the globalist system, and return the world to the kind of optimistic, pro-industrial outlook which U.S. President Franklin Delano Roosevelt and our own Prime Minister John Curtin exemplified in their collaboration during World War II. The real issue here is the nature of mankind. Are men and women created in the image of the Creator, to continue His work of creation, and leave a far better world for our descendant s , s o ensuring our own immortal contribution to mankind? Or, are we cattle, to be herded and manipulated for the benefit of a rapacious financial oligarchy? The oligarchy is terrified of the truth. Read this address carefully, because the future of the world, and of Australia, depends upon understanding what is now happening in the world, and then acting upon it. This is truly the beginning as society has been miss guided by materialisms and promoted by the system, advertising. Media. And so on. Our sons and daughters will be the lost no matter whom we think we are, as there will be no order to this materialistic demise, and most will be affected directly or indirectly. when contraversy is removed ,a onesided view is slowly forced without the subjects knowing, this is how media and goverments control the masses, we live in a democratic county and have the right of opinion. today intervention by groups who limit and filter information for there own good have manipulated the globe to the point of destruction this is the karma that we now await for, ! the globe has been lead by greed and manipulation and the truth its casualty ,and the innocent the victims today the rich eat the poor,! tommorow the poor will eat the rich, karma!!! the poor can live poor ,but can the rich, ? even the twin towers as tall and strong collapsed by manipulation so to will the impowered control the collapse of an economy! do the math and see the media manipulation and watering down of facts see john howard on the backfoot with interest rates see george bush pulling the strings of a global disaster and the audiance . 15 Jan 08, 14:28 demise of the dollar? Yes, I understand the value of gold. However, you can't spend it! If you have any wealth at all, please keep it in CASH nearby. I hope not because this would not have happened under that George's and Abe's watches. When it does, you won't have time to get to your bank. If you do, there will be a hundred ahead of you! For 26 years we have had a Bush Senior White House with no end of it in sight!This means that Daddy Bush's "New World Order" is just around the corner. There is salvation and eternal life believing Yahshua, the Son of Yahweh. The ancient Hebrew word HalleluYah means "Praise ye Yah". 19 Feb 08, 11:31 Best Plan Other than buying gold ? I am just wondering how buying gold works. I understand that as a precious metal it will hold value much more than paper money. If I were to buy gold my money is there and secure. But if a collapse were to occur wouldn't the value of gold also go down along with everything else? Or are you saying that just because the US dollar becomes worthless does not mean the world economy will fail, therefore the gold will hold it's value better? I do not need to group myself with conspiracy theorists to KNOW what is happening. I feel it, I see it. I am worried short term about being able to feed my family if/when the economy collapses. What is the over all best plan besides just buying gold? 21 Feb 08, 06:32 Investing Other than gold? Gold is there to survive an inflationary spiral, I personaly dont understand why gold has value, but I'm prepared to accept that it does because its been used as such for 4000+ years. If it REALLY all goes to hell, gold doesnt cut it, in my opinion, your better with food and water. 30 Dec 08, 03:15 In the end..
ok he was right about stocks and wrong about the RE rebound as well as so far wrong about Treasury's because they Rallied in large part since the article was written.....but treasury's may implode within the year....we will see. 23 Oct 09, 22:30 I'm not sure its still over. Heh. He was right alright. I don't think the Federal Reserve is still in any mood to save the dollar. The fat lazy companies which were bailed out are all satisfied again. All empires collapse. It is the turn of the US financial empire. 08 Apr 11, 19:43 Pristine article, in 2006 it dragged me into the real world. Remarkable, pristine, state of art. In 2006 I had just started investing in financial assets. This article it dragged me into the real world. Shocking. Then I read Alf Field, Jim Willie CB and Antal Fekete. In feb.2008, I moved 100% into gold. Now in 2011, so far so good forecasts. The core fundamentals all confirmed by facts. Thank you, Larry Edelson ! All credit to you for such a bold move. 100% into gold, huh? That takes balls! Just one thing. You'd better be holding physical gold in the form of bullion coins - and NOT gold bars or ETFs or any other form of paper promises on gold. We are hearing more and more reports of tungsten filled gold bars which are worth but a fraction of what a genuine bar would be worth. They're mostly excellent forgeries, too. You don't want to be holding bars, and you don't want paper promises against bars that could also turn out to be tungsten-filled. Many of them (an unknown percentage) are WITHIN the bullion banks system and will never be assayed until such time as the chain of trust in transporting them from vault to vault is broken. This is something all gold investors need to be very, very aware of. Hold bullion coins. Go out to the hills one night by yourself and bury them nice and safe. You won't regret it.